The new series Midnight, Texas will be premiered at a panel tomorrow (Saturday, October 8) at New York Comic Con. Attendees will be treated to a first look and discussion of the show. 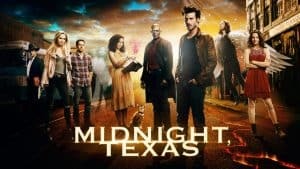 Based on the best-selling book series by Charlaine Harris (author of the novels that inspired “True Blood”), Midnight, Texas is about a remote Texas town where nothing is what it seems. Home to a vampire, a witch, an angel and a hitwoman, Midnight is a mysterious safe haven for those who are different, that is, until the arrival of a powerful psychic and the murder of one of their own. As the town members fight off outside pressures from ever-suspicious cops, deadly biker gangs, and their own dangerous pasts, they band together and form an unlikely but strong family.